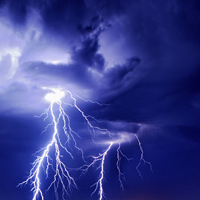 Mom’s (88) Alzheimer’s escalates during heavy rain storms, particularly thunder and lightning. She paces from room to room and even becomes aggressive which is really scary with middle of the night storms. What does this mean? Dad’s (91) lived with us for six years without major problems until last week when a thunderstorm sent him into a panic. During most storms Dad sits with his dog Barks—they seem to comfort each other. Last week Dad shoved Barks away and starting pacing, holding his head and moaning. What’s going to happen if we have a hurricane? Talk with Mom’s neurologist regarding medication to calm her during storms. Minimize the sounds of rain and wind with music or by closing curtains and closing doors to rooms with windows. Reassure Mom she’s safe with your actions: smile, hug, use gentle touches, fold towels, play games, listen to or sing along with her favorite music. Keep your voice and body language calm – dementia patients mirror their caregivers behavior. If you’re anxious, Mom’s agitation and anxiety will increase. If Mom can still understand “wind” and “rain” you may be able to calm her by explaining the storm while reassuring her with your words, body language, touch, and smile that she’s safe. For detailed help managing storm behavior call the experts at Alzheimer’s Community Care (Martin772-223-6351/St. Lucie 772-460-9166; Ft. Pierce 772 466-3261); Alzheimer’s Assn. (800-272-3900); Vero Alzheimer’s/Parkinson’s Assn. (772-563-0505).